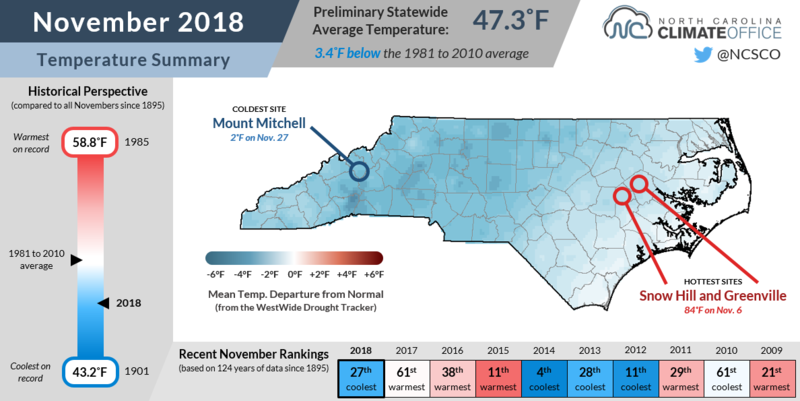 November in North Carolina was another wet month accompanied by the arrival of wintry temperatures and the ending of the Atlantic hurricane season, which was an impactful one in our state. 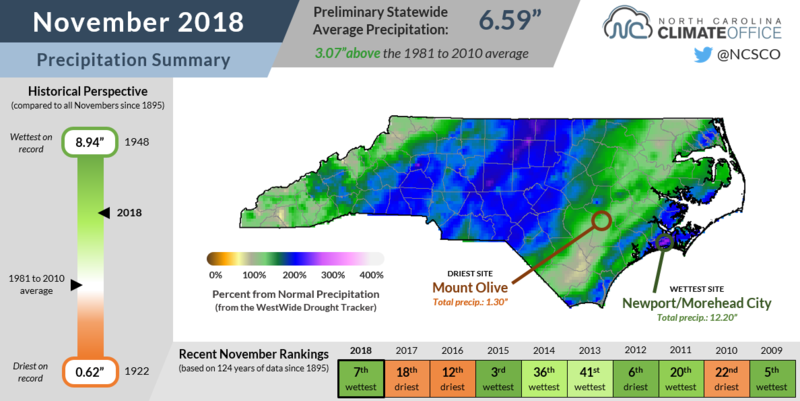 A wet year so far in North Carolina got even wetter last month as most of the state received above-normal precipitation. The preliminary statewide average precipitation of 6.59 inches ranks as our 7th-wettest November on record since 1895. A series of cold frontal passages and low pressure systems moving off our coast helped bring us regular rainfall, and the Mountains even picked up some frozen precipitation. On November 15, cold surface temperatures resulted in a freezing rain event, and with the combination of saturated soils and winds with that storm system, a number of trees fell, including along the Blue Ridge Parkway. Later in the month on November 27 and 28, another event saw up to two inches of snow fall on Mount Mitchell and parts of the Parkway close due to the treacherous conditions. At the other end of the state, the weather was at times more like spring than winter along the central coast. Three tornadoes were confirmed in Carteret County by the National Weather Service in Newport: an EF-1 in Atlantic Beach on November 13, an EF-2 in Emerald Isle on November 24, and an EF-0 just west of there in Cape Carteret on the same date. Of interest was a tremendous amount of leaf debris that was along the north and east sides of the houses along both Live Oak Drive and Park Avenue. Although very subtle, this leaf debris could only occur on those sides of the homes with a north to northeast wind, which was in the opposite direction of most of the storm damage and therefore indicated likely rotation. While the threat of more severe weather should diminish this winter, our current wet pattern probably isn't going anywhere. With an El Niño event continuing to take shape as sea surface temperature anomalies increase across the central Pacific Ocean, we expect El Niño's atmospheric impacts -- including a stronger subtropical jet stream and a storm track to our south -- should continue to send moisture-rich weather systems our way this winter. Seeing wetter weather in the late fall before an El Niño winter isn't unusual. In fact, it is fairly common. The past 7 El Niño winters were all preceded by a wetter-than-normal November in North Carolina. While it once appeared that summer didn't want to end this year, with warm weather extending into mid-October, we've been firmly entrenched in a cooler pattern since then. Last month was no exception, as the preliminary statewide average temperature of 47.3°F ranked as our 27th-coolest November out of the past 124 years, and the coldest since 2014. Mean temperatures over the past month were 2 to 5 degrees below normal, on average. Those big departures were driven largely by our cool maximum temperatures, which were up to 9 degrees below normal in Marion. As we discussed in our Winter Outlook, a weakening polar vortex and more wobbly polar jet stream has allowed cooler air to dip farther south recently, giving us some downright cold days and nights. High temperatures across the state barely made it out of the 40s on Thanksgiving Day, and nighttime lows at Mount Mitchell dropped to 2°F on November 28. That was the coldest November night there since temperatures hit 0°F on November 19, 2014. Weather delays keep impacting harvest activities and planting of small grains. Grain quality issues are being reported in the area. Field conditions remain wet entering into the week. With no named storms in November, the 2018 Atlantic hurricane season wrapped up a bit early once Oscar fizzled out on Halloween afternoon. However, it was still an active season overall with 15 named storms and 8 hurricanes -- both above the 1981 to 2010 averages of 12.1 storms and 6.4 hurricanes, respectively. Two storms affected North Carolina, which is on par with our long-term annual average. However, it's hard to remember two more impactful storms in a single year than Florence and Michael, which hit just a month apart in mid-September and mid-October. Florence caused 42 fatalities and an estimated $17 billion in damage in North Carolina, largely due to flooding as the slow-moving storm dropped up to three feet of rain across parts of the southern coast. As of December 2, $525.8 million in National Flood Insurance Program claims had been paid in North Carolina with $119.2 million approved in grants for homeowners and renters and $324.4 million approved in Small Business Association loans. According to the Department of Public Safety, homeowners, renters, and business owners have until December 13 to apply for assistance from FEMA and low-interest disaster loans. 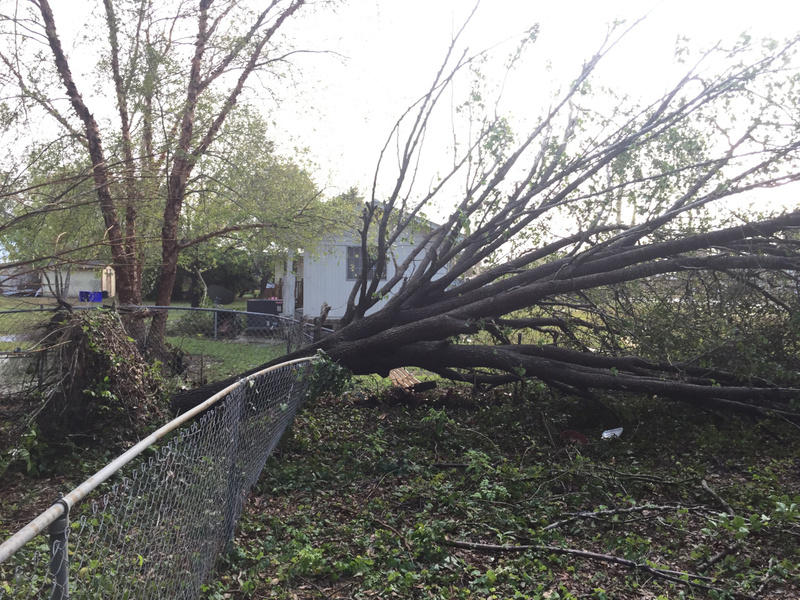 Michael was primarily a high-wind event in the western part of the state, and the three deaths in North Carolina attributed to the storm -- two in McDowell County and one in Iredell County -- were all due to trees falling on cars. The rain from both storms has many North Carolina locations and other sites across the eastern US already near or past their record annual precipitation totals entering December. With 95.81 inches so far this year, Wilmington is well beyond its old record of 83.65 inches, which it surpassed during Florence.